The strange saga of Matt Kuchar and his fill-in caddie -- a man by the name of David Giral Ortiz or "El Tucan" -- has (sort of) come to a close. 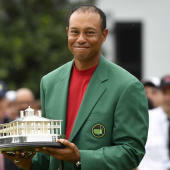 It might not be a happy ending, but at least we now have at least a few of the facts, courtesy of Golf.com's Michael Bamberger. The story first broke back in January during Kuchar's Sony Open victory. Kuchar apparently did not pay El Tucan very well during his win at the Mayakoba Classic last fall, where he amassed winnings of $1.3 million. Ortiz was a substitute for the week, and it was first reported that Kuchar only gave him $3,000 for the win. Kuchar later denied that saying he didn't give him the customary 10 percent earnings on a win but that he also didn't only give him $3,000 either. So we were left to wonder what he gave him between $3,000 and $130,000. Wonder no more, says Bamberger. Kuchar gave Ortiz $5,000 or 0.38 percent of his winnings. Here's Bamberger on Golf.com. By Sunday night of the tournament, Kuchar's smiling face was sunburned and covered in stubble. He and Ortiz posed for pictures together with the winner's trophy. Later, Ortiz said the golfer handed him an envelope with his payment in cash in it and said, "There you go. Thank you. Bye." A bizarre move to be sure. Ortiz apparently asked for more than that, writing an email to Kuchar's agent, Mark Steinberg, which read, "I am a humble man, who takes care of his family, and works hard. I am reaching out to you to see if you can facilitate me receiving a fair amount for my help with Matt winning $1,296,000. I am not looking to disparage Matt or give him a bad name. Fair is fair, and I feel like I was taken advantage of by placing my trust in Matt." At some point, it seems like Ortiz was offered an additional $15,000, which he turned down. The entire story is weird and uncomfortable, and I'm not sure this "resolution" did anything to quell that. I suppose it does depend on when exactly Kuchar offered the extra $15,000, but even $20,000 is only 1.5 percent of winnings, a paltry amount for anyone, much less a tour pro. Although I'm not totally sure why Ortiz would basically say, "Nah, I'm good" to $15,000. But here we are. There's not really anywhere else for the story to go unless Kuchar forks over more money to Ortiz until the event takes place next season. It's not a great look for really anyone involved, and it remains one of the more bizarre tales we've seen on the PGA Tour in quite a while given who the participants are and how it came to light.